I've been driving one of my Little Red Express lately, and been thinking about buying a new Half Ton and making a customized Little Red Express or Warlock. Leaning towards a Warlock. Tap a new LRE with a diesel and you'd have something. Too bad they don't make the old "step" boxes like the original LRE had. 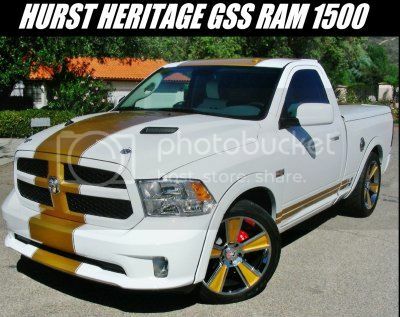 Doug Duell bought a Ram with the little Diesel and it was a dog towing a 24' trailer and race car. He quickly sold it. Transmission was always hunting for a gear on flat ground and wouldn't pull uphill. I'm not impressed with the new 'little' diesel either not to mention a 4x4 crew cab weighs nearly 6100 lbs. My 24' trailer weighs 4600 empty. Do you know how much weight Doug was pulling? On paper, it sounds good with 420 ft lbs of torque but in 3.0 package....and at what rpm? Max towing is 7650 iirc but to me it's mainly a fuel sipper with the ability to do 'some' work. And an 8 speed trans? His wagon and Barracuda weighs a touch over 3200# towed in an aluminum 24' trailer with golf cart, tool chest, and other racer stuff. Pretty standard. Just wasn't up to it. He traded for a used 3/4 ton and Cummins. I don't do a ton of real hauling\towing and so to me wouldn't be a really big issue. Hell, I even owned an Isuzu\Chevrolet LUV at one point (talk about a vehicle that couldn't get out of it's way). I just think they're more fuel efficient. I got in the low 30's for mileage and drove that thing to death. First vehicle I got more that 200,000 miles on. Had an Earl Scheib paint job and looked decent enough. Transmission was failing and couldn't get parts from either GM or Isuzu any longer. And no, I have never owned any "cool" vehicles. where are you finding new Dodge trucks that DON'T have more-doors? you can't find a reg cab around here to save your life, 4 door is becoming today's "regular" cab. I'm tired of seeing. I like pickups and as long as my 95 Dakota yard cart keeps running, I'll keep using it for my go fer truck. Heck, even used it to haul scrap. If it was loaded right, it would still drive ok with 1600 lbs on it but in the past year or so, I haven't even done much of that. Most of it was coming from working estate sales and I'd haul off the left overs or do the clean up before opening day but man, it's just too hot sitting in a hot garage with a fan blowing hot air on ya for 2 or 3 days in a row while the women stayed in the AC cooled house. Anyways, sure wish I had kept my 92 5.2 with 3.90 gears. I ordered it new and got the heavy duty suspension on it plus limited slip. It ran decent enough to keep me awake (15.30 1/4 mile ET) plus it would tow a decent sized trailer. Oh well. Haven't been able to find a decent V8 RC Dakota since. I see lots of RC full size trucks around here but a lot of people buy the 4 door as a family car. The 4 door trucks ride decently enough to pass for a car, are roomy and can actually do some work and haul stuff. I don't want one though. My wife still has her Durango if we need to go somewhere with the family but that doesn't happen all that often anymore either. The kids are grown and gone so we really don't need anything big for hauling humans.